Bobby's Burger Palace Review: Vegan Friendly? I like a good 'dining out' challenge! 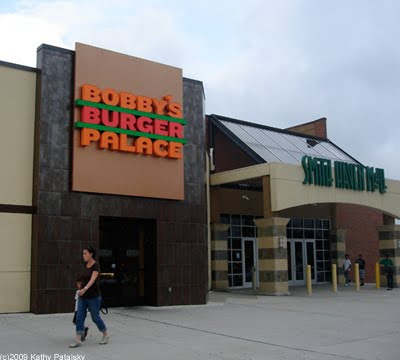 A few weeks ago I had a rare opportunity to journey out to the land of suburbia known as central Long island New York, and eat at Bobby Flay's new restaurant Bobby's Burger Palace. How did a vegan like me end up at a burger joint? Yummy Veggie Burgers Exist. I recently read that Bobby has never eaten a veggie burger that he likes. Well Bobby, I challenge you to a Veggie Burger throwdown. One bite of my Mean Green Edamame burger or my Thanksgiving in July Backyard Burger and you will be knocked out and I will will be declared the winner. Veggie Burger? As I perused the online menu before we hopped in the car, I figured that I'd get the veggie burger. The only problem, and this is a big one, there is no veggie burger on the menu! Big bummer. You can indeed substitute the main burger with say a turkey burger or chicken breast, but no veggie burger! Big sigh. But I didn't give up there. I like to pride myself on being a vegan who can eat just about anywhere, and keep a smile on my face. So we hopped in the car and I put on my game face. BBP. I have to admit, Bobby's Burger Palace is really fun place. We entered at around 5pm on a Sunday, just as the evening rush of local families came piling in the door. This was a big rush! I never realized so many people eat dinner at 5pm! All the sudden little kids, big kids, stroller kids, babies, moms, dads and friends came plowing through the door to get in the order-up line. You see there are no formal waiters at BBP. 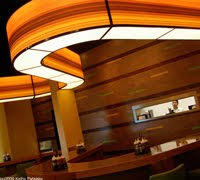 You simply get in line, give your order to the cashier, take your number, sit down at a table or the wavy burger bar and the friendly food delivery folks bring you your meal. Very low key, very casual, incredibly family-friendly. (Families, kids...another really important reason why a healthy veggie burger should be on the menu). 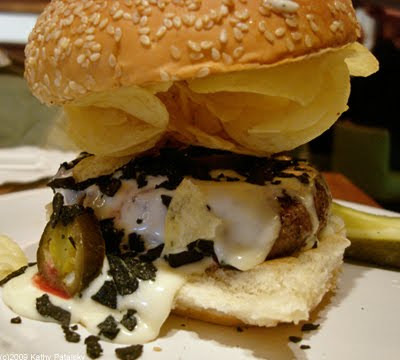 Crunchified-adding a layer of potato chips to your burger. Do You Have a Veggie Burger? I stepped up to the plate (otherwise known as the cashier) and I had to ask my question "Do you have any veggie burgers?" I knew that answer already, but I still like to make an impression. I secretly hope that the cashier will relay my question to her manager, who will in turn relay that question to the head chef who will in turn inform Bobby Flay himself that 'people' have been asking about a veggie burger. Who knows if my question ever even makes it to the kitchen, but at least I tried. So what did I order: the big salad. I ordered the Crunch Salad with no cheese. I made sure the balsamic dressing was vegan. I also ordered a side of sweet potato fries. To drink, I'd stick with the iced tea. Shakes and Gripes. I was surprised to see ten different varieties of milkshakes on the menu. Ten! Including a blueberry-pomegranate flavor. OK, ten kinds of milkshakes but no veggie burger?! I looked around the room at all the little kids chowing down on their meals and felt a bit sad that they didn't have the option of ordering a veggie burger. I remember as a kid myself, even before I was a vegetarian, I'd always order the Soy Burger from Carpo's in Santa Cruz California (my hometown). I didn't have to order it, I just liked it better than the meat options. And it lead me to experiment even more with veggie food options. 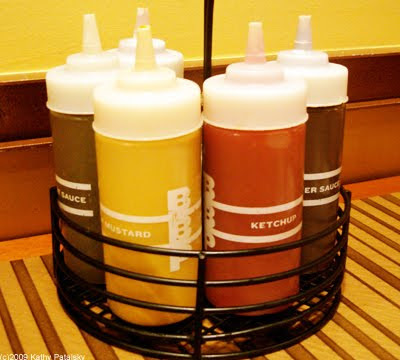 My Review: Bobby's Burger Palace, BBP. Restaurant and tested food: "Crunch Salad" "Sweet Potato Fries"
The Food: The salad looked, well, like a big salad I might get at a pizza place. 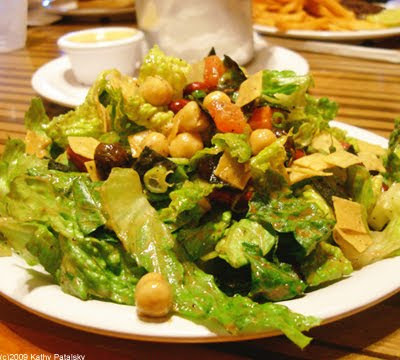 Garbanzo beans, green romaine lettuce, balsamic dressing. It was served on a plate, which was a bit messy. 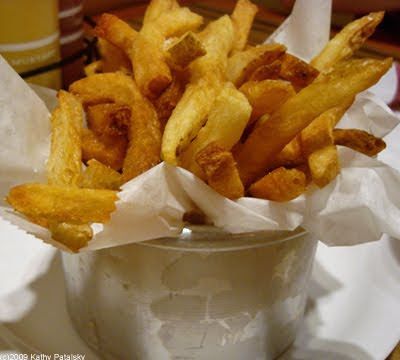 The fries looked beautiful in a shiny silver can and wrapped in a strip of parchment paper. Crunchy and not over cooked-they looked and smelled fresh and delicious. 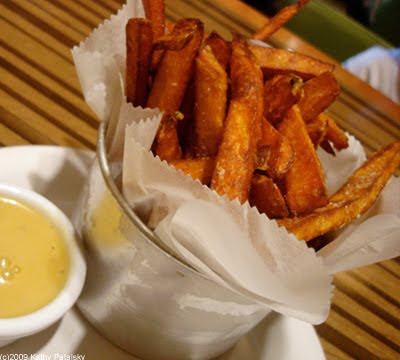 The option for sweet potato fries instead of white made me super pleased. Label Check: Unlike NYC, there are no labeling requirements for menus on Long Island. So I really have no idea what the caloriage was. However, the fries were not greasy, which is a great sign. And the salad was in a balsamic dressing that did not seem overly oily. I probably should've asked for dressing on the side since they put more on than I would've liked. The salad was packed with various healthy veggies and beans, but those crispy tortilla strips were not doing anything for me nutrition-wise. Stating the obvious: BBP's main priority is not the health-factor. But healthy is still doable. Taste Test: I was really hungry. So my first bite of a sweet potato fry tasted like heaven. Warm and creamy on the inside, crisp and chewy on the outside. Yum. I don't eat fries all that often, so this was a treat. I'm glad they were good fries. The salad was better than I expected. The dressing had a nice tangy flavor and the salad greens were dark (romaine is better than iceberg at least). The beans were fine. Nothing over the top great, but for a casual family dining experience, it passed the test. Price Check: Very reasonable. Wow I can say that I ate at a Bobby Flay restaurant for just over $10! $3 for the fries, $7.50 for the salad and around $2 for a beverage. Bobby Flay on a budget. “I’m not interested,” Flay said, when asked what his feelings were on veggie burgers at Bobby’s Burger Palace, a new restaurant he’s opened. VegetarianStar has the complete report.